Many of us get up every morning and head off to work. And then there is local potter Joy Ingram of Brown Bear Pottery who goes to her studio where she spends hours upon hours throwing bowls, pots, plates and many other beautiful pieces she offers. The process is not as simple as one might think and can take several days just to complete a batch of pottery started by throwing, drying, firing, glazing and firing again. Clayware takes on varying physical characteristics during the making of pottery. Greenware refers to unfired objects. At sufficient moisture content, bodies at this stage are in their most plastic form (they are soft and malleable, and hence can be easily deformed by handling). Leather-hard refers to a clay body that has been dried partially. At this stage, the clay object has approximately 15% moisture content. Clay bodies at this stage are very firm and only slightly pliable. Trimming and handle attachment often occurs at the leather-hard state. Bisque refers to the clay after the object is shaped to the desired form and fired in the kiln for the first time, known as “bisque fired” or “biscuit fired.” This firing changes the clay body in several ways. Mineral components of the clay body will undergo chemical changes that will change the color of the clay. Glaze fired is the final stage of some pottery making. A glaze may be applied to the bisque form, and the object can be decorated in several ways. 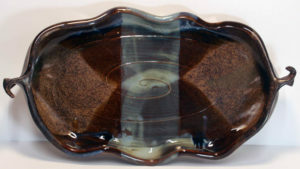 After this, the object is “glazed fired”, which causes the glaze material to melt, then adhere to the object. 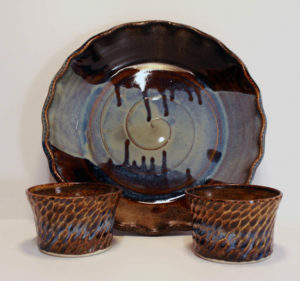 The glaze firing will also harden the body still more as chemical processes can continue to occur in the body. Joy A. Ingram began working in clay at the tender age of nine when her mother enrolled her in a wheel throwing class to keep her out of trouble. That single act ignited a passion for Joy that carried her through college and several amazing pottery instructors. Graduating from Ohio University in 1998 with a degree in organizational communication, Joy set out to enter the professional world with the pursuit of clay always in the back of her mind. 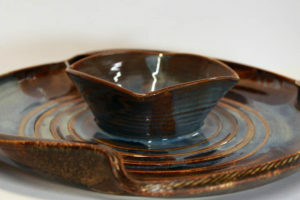 In 2003, she began focusing on pottery full time through a two-year apprenticeship with master potter Jim Anderson. Joy and her husband, Zach, work the business together while Joy makes her pottery Zach is managing the business, Twice a year they open their home the Spring / Mothers Day open house this year will be the weekend of May 5 & 6th and then again their Christmas open house. Open house’s at Brown Bear Pottery more than just a peek behind the curtain Joy and some her family make some of the most delicious treats to go with the pottery after all her serving pieces are designed just for that. Most of the year joy creates her wares, and then they spend much of their time at outdoor festivals during the summer and fall. However, the gallery maintains a full stock of Joys’ work, and we are very proud to be the only gallery to carry her work. May 12, 2018, Joy and Zach will be in-house doing a live demonstration of throwing; it is an entirely fascinating process to witness. That day the gallery will feature at least three Artist demonstrating the work they do. More to come on that subject.